Dancing with the Stars: Live! 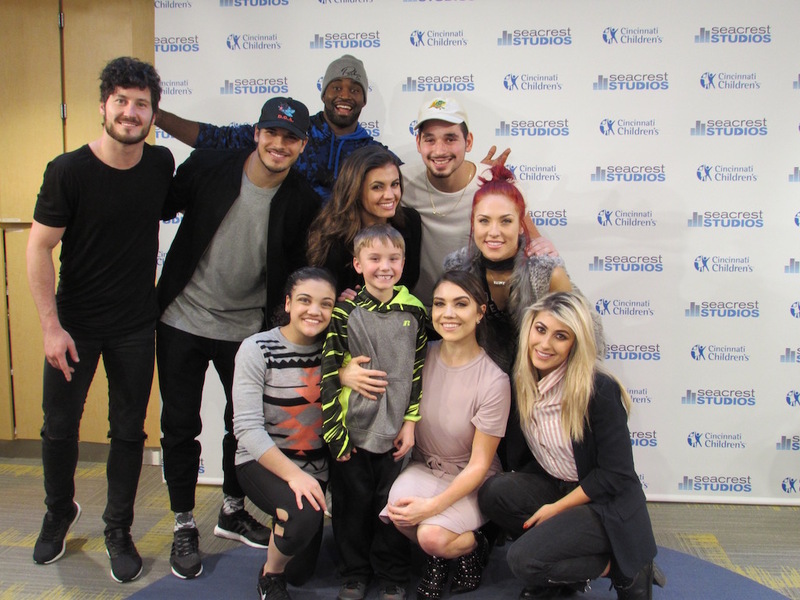 cast members took a break from their tour to hang out with the kids and families in Seacrest Studios at Cincinnati Children’s Hospital Medical Center. It didn’t take long for a few avid fans to get emotional after nine of the dancers stepped foot in the studio. Trading in dancing shoes for a microphone and headphones, we went live on air with a question and answer session--chatting about everything from Disney princesses and superheroes to the dancers’ dream jobs. When asked her biggest inspiration, Sharna Burgess shared, “We have the opportunity to make people feel great or enjoy their day or change their mood or inspire them, and I think that is actually what inspires us the most.” We learned the dancers have other talents as well, as Keo Motsepe broke out into an endearing version of Lionel Richie’s song “Hello”. Next up was an exciting game of charades. Channeling their inner-animals, Laurie Hernandez, Alan Bersten, Jenna Johnson, and Keo gave us their best versions of monkeys, birds, elephants, and more. The patients and dancers guessed the enacted animals at a rapid-fire pace. Val asked the kids in the studio where they are from and their favorite sports team. The studio was bursting with laughter when an adorable patient named Kailee said, “I’m from my house.” The visit concluded with a meet and greet picture session. Dancers surprised kids with toys and stuffed animal gifts. A big thank you to the Dancing with the Stars: Live! cast members for making each patient feel special and filling the studio with energy and laughter!